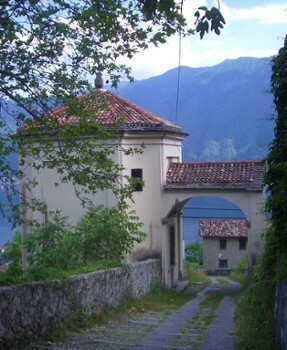 The Sacred Mount of Ossuccio is one of the nine sacri monti in the Italian regions of Lombardy and Piedmont which were inscribed on the UNESCO list of World Heritage Sites in 2003. 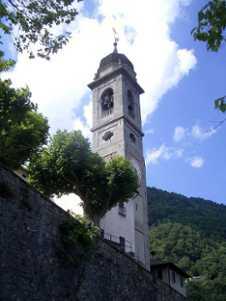 The devotional complex is located on a prealpine crag some 200 metres above the western shore Lake Como, facing Isola Comacina and some 25 km from the city of Como. Surrounded by olive groves and woodland, it is quite isolated from other buildings. This sanctuary is part of a series of shrines along a one kilometer cobble stoned walkway. 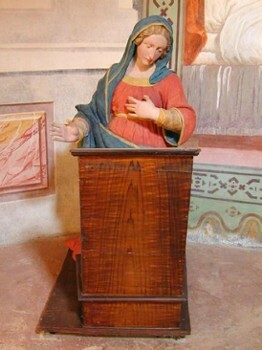 The shrines depict scenes of the Madonna’s and Christ’s life and are represented by frescos and natural size statues made of stucco and terracotta. 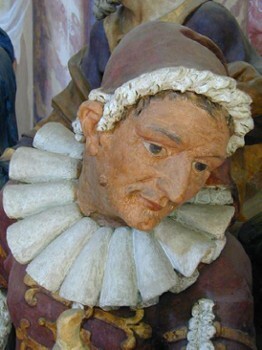 The statues were created between 1635 and 1714 by various artists of Como and the Ticino area. You ascend the Via Crucis, with stops at the shrines to admire the statues, on to the Sanctuary. 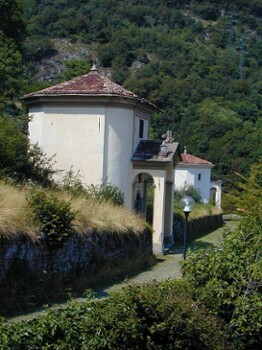 The fourteen chapels, constructed between 1635 and 1710 in the typical Baroque style reflecting the Counter Reformation ethos of the sacre monte movement, are joined by a path which leads up to a pre-existing sanctuary of 1532 placed on the summit and dedicated to La Beata Vergine del Soccorso. The construction work of this Sacred Mount began in 1635 at the 16th century sanctuary of the Madonna del Soccorso. 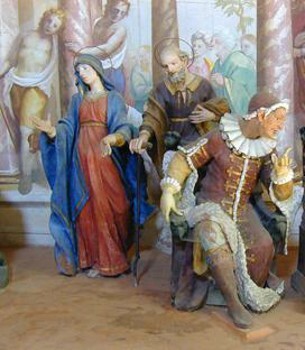 The founders or promoters are not known, but the devotional complex seems to have been started on the initiative of the Franciscans and the local noble families. The Sacred Mount consists of fifteen chapels, dedicated to the Mysteries of the Rosary, built between 1635 and 1710. 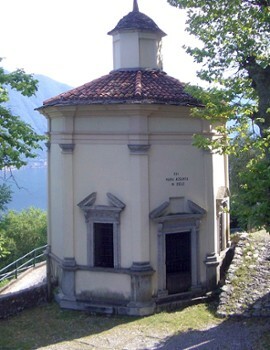 The chapels are distributed along a climbing path that leads to the sanctuary of the Madonna del Soccorso, in which the last aedicula is located. The set of chapels, surrounded by vegetation and connected by a paved road that passes through olive orchards, gives the complex great harmony between architecture and the surrounding landscape. The construction forms vary, and include rectangular baroques chapels and central-layout chapels. One architectural particularity are the porticos, which, on thin columns, extend along the road for its entire length and create a close tie between the itinerary and the single aediculae. The Sacred Mount is populated by two hundred and thirty statues in stucco and terracotta. 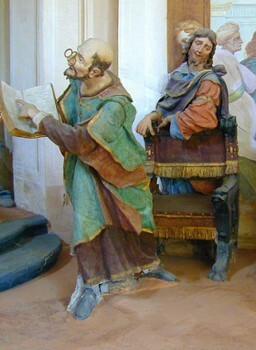 We know from documents the paternity of the stucco sculptures who was Agostino Silva; the frescoes were painted by Carlo Gaffuri, Innocenzo Torriani and Gian Paolo Recchi. Nearby Things to Do include: Hikes & Walks such as Hiking Monte Crocione and Hiking Monti di Nava; Towns such as Sala Comacina and Lenno; Water Activities such as Lido Ossuccio and Hiring a Boat; Villas such as Villa Balbiano and Villa Rachele Beccaria; Parks & Gardens such as Parco Mayer Beach and Teresio Olivelli Park; Churches such as Santuario della Beata Vergine del Soccorso and San Giacomo.